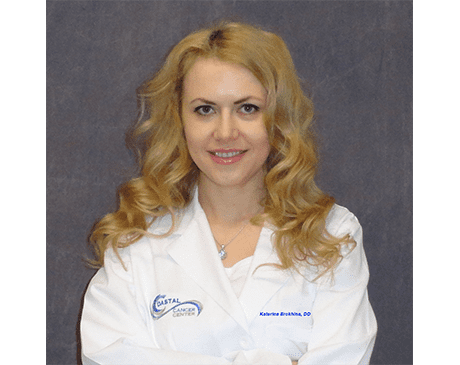 Dr. Katerina Erokhina joined Coastal Cancer Center in 2018. A native of Ukraine, she received her undergraduate degree from Old Dominion University in Norfolk, Virginia, and her medical degree from West Virginia School of Osteopathic Medicine, West Virginia. She finished her Internship and Residency at Palm Beach Consortium for Graduate Medical Education in West Palm Beach, FL. She then completed her Fellowship in Hematology/Oncology at Michigan State University College of Medicine/ Providence Hospital in Southfield, Michigan. Dr. Erokhina is Board Certified by the American Osteopathic Board of Internal Medicine in Internal Medicine and Medical Oncology. She is an active member of the American Society of Clinical Oncology (ASCO), the American Society of Hematology (ASH), and the American Osteopathic Association (AOA). Dr. Erokhina’s hobbies and interests include outdoor activities, hiking, yoga, reading, and spending time with her cat.